My weekly images post was interrupted by 10 hours without power last night. We made do with some candles and a cozy fire, and didn't mind the storm too much. Besides, last week ended up being a bit short on photos. I just have one, plus a recipe for you. Have fun! I expect this is an old recipe, but I've altered it slightly to make small batches, so I could make lots of colours. This makes a 1 cup batch. If you want to make scented dough, try essential oils like vanilla, lavender, or mint. The glitter is just for fun! Put the water in a small pot, then add your food colouring. If you have liquid colouring, you will need at least 8 drops, depending on how vibrant you want the colour. With the gel food colouring you need less. I used about 1/8 to 1/4 tsp of gel colouring for mine. Then add the rest of the ingredients in order, except glitter. Whisk until the mixture is smooth. Place on medium heat, and stir constantly with a spoon. The dough will start to congeal almost immediately. Continue stirring until the dough forms a ball and comes away from the sides of the pot. Dump the dough out onto the counter, and let it cool for 5-10 minutes. Then knead until smooth - at this point you can add the glitter. Just pat the dough into a flat circle, sprinkle the glitter on top, then knead it into the dough. Store the dough in an air-tight container. In the fridge it will keep for months. Next, make more colours! I made 4 batches in under an hour, so it's easy to make lots in one nap-time. Posted by Barbara Prime at 6:26 p.m.
August 29, 2011 at 6:48 p.m.
August 29, 2011 at 7:24 p.m. I just did this for my kids today! haha! 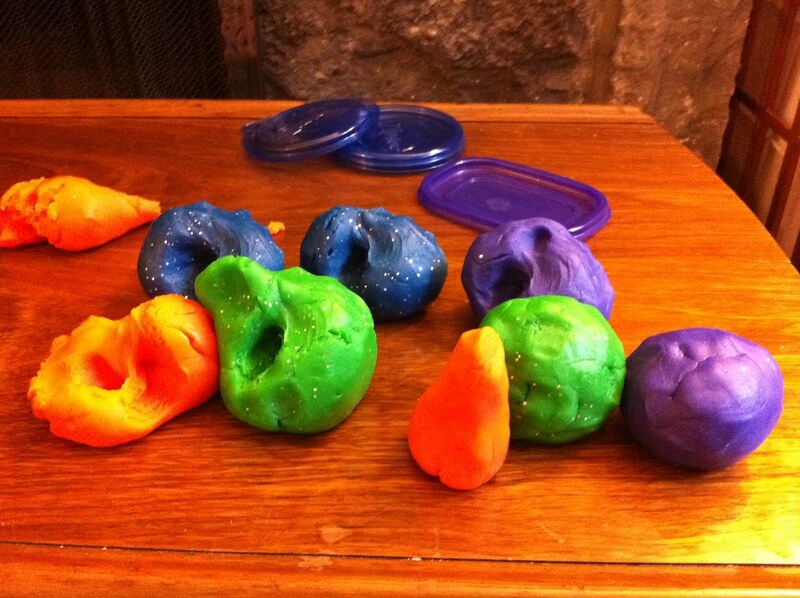 We make homemade playdough all the time because it stores better then store bought, smells better, and Nick eats his weight in it! It is so nice to make on a cold day, and give it to them slightly warm. They love it! September 4, 2011 at 6:39 p.m.